Electric Vehicle Trial Act now to reduce emissions. Take the third step in your journey to electric with an EV trial. 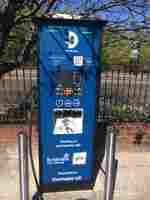 Whilst this page is being redeveloped, you may like to read how St Albans took on a trial of both rapid chargers and e-Taxis within the city centre. We supply fully managed and licensed electric taxis to your taxi community. All rental EVs have full Electric Blue EVolve tracking enabling us to provide drivers with a comprehensive analysis of their rental period and savings made by 'going electric'. We manage the marketing, sign up and rental of the e-Taxis and all other electric vehicles for other commercial business drivers.